So, you’ve found some mold growing in your home and you head to the laundry room to grab the bleach to get rid of it. But are you really getting rid of it? Most likely, no–unless the mold growth is on a non-porous surface. Although bleach can kill mold on non-porous surfaces, it isn’t effective on absorbent or porous materials — you know, the places it loves to lurk, like grout, caulk, drywall, insulation, and carpet, according to the Centers for Disease Control and Prevention. Instead, it just bleaches it so you can’t see it. And diluted bleach can feed future mold growth because only the water will be absorbed, which mold just loves. A better approach for getting rid of mold is to use a commercial anti-fungal product to take out mold at its roots. And only tackle mold removal yourself if the area is less than 10 square feet and you use protective gear, such as a respirator and chemical-resistant gloves. Otherwise, call in a professional mold remediation specialist, like Duraclean who knows how to remove it without spreading it’s spores. 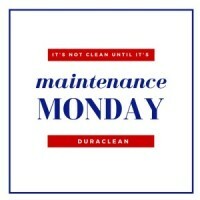 If you have any questions, or would like to setup a mold inspection, please call our office at 732-2000 or email us at courtney@duraclean.net.